On this page, Laurette demonstrates the PraiseMoves posture called The Prize. Below you will see part one, “Forgetting those which are behind…” and below it The Prize posture, part two, “and reaching forward to those things which are ahead, I press toward the goal for the prize of the upward call of God in Christ Jesus” (Philippians 3:13-14). Your bible may be like mine. Have you noticed that some words are italicized? Italicized words indicate they were added by the bible translators for clarity. I often read passages silently or aloud and purposely ignore the italicized words to see (and hear) if I notice a difference. Punctuation was also added by the translators, so that can also make a difference in how we read and understand a portion of scripture. In addition, some words are explained by definitions in the margin (i.e. “apprehended” means “laid hold of,” “caught” or “captured”). In my bible, the word “apprehended” has a semi-colon after it. You may also notice where Paul writes “but one thing I do,” the words “I do” are italicized. Let’s read this sentence out loud, removing some of these additions made by the translators. What about “forgetting those things which are behind,” isn’t that part of it? Yes, but Paul writes he has apprehended “one thing,” not two. In order to reach forward, you must let go of the past. Who do you need to forgive right now and leave behind you so you can press on to win? Here's a powerful Goal Setting exercise to help you focus on what's important in 2013. 1. Your 2012 Successes. 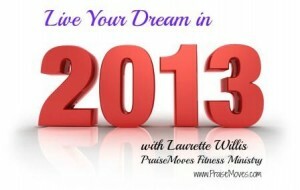 Write down all of the victories, wins, successes you experienced in 2012. A look at the calendar will often jog your memory. Write them down quickly on a piece of paper. Next…2. Identify at least one thing you learned from each success. What did you learn? Quickly jot those down. 3. Your 2012 Losses or Mistakes. We don't often like to write these down, but it's important for this exercise. Don't worry, no one else will see it. 4. What did you learn from the failures? I heard Joyce Meyer say, “You can fail your way to success.” That's true! Just do not give up. The only way one can truly fail is to give up. — Write down at least one thing you learned from each thing that didn't go quite right for you this year. Homework – Take the “failures” piece of paper and fold it up into a very small square. Take both pieces of paper and the scripture from Philippians 3:13-14 and bring them before the Lord. Prayer “Lord, I thank You for bringing me through this year. Here are some of the successes and failures of this year. I've learned a lot and I'm ready to move forward, following You, and refusing to make the same mistakes or be less than who You have called me to be. Lastly… Now, and this is very important – take the little piece of folded paper with all the “failures” of 2012, take it to a safe place and BURN IT. Yes, burn it. It's up to you what you would like to do with the “successes” piece of papers. The Hebrews often built memorials to remind them and future generations of what the Lord had done. You may want to put the list of successes and victories in your Bible to remind you of what the Lord has done. What He did before He will do again. He will NEVER fail you! Start writing some notes of things you want to accomplish in 2013. Go to the Lord and ask Him to guide you. 1 Response to "Make Way for the New!"